A series of live concerts are set to be held at the Olympic Stadium this summer. A teenage witness who gave evidence in the trial of N-Dubz rapper Dappy has spoken of her upset after being targeted by the musician's fans on Twitter. Flroence Welch gave an impromptu performance on the London Underground, after she was spotted by fellow travellers. Paloma Faith has revealed LA Reid has become like a father to her after taking her under his wing to help her crack the US. Justin Bieber has become the most followed person on Twitter. New Kids On the Block, 98 Degrees and Boyz II Men are teaming up for a summer tour. Alesha Dixon has said Atomic Kitten and 5ive aren't guaranteed to sell more records on the back of their TV reunion. Bon Jovi are to headline a newly announced festival which will be staged in London's Hyde Park this summer. Adele will perform her hit Bond theme Skyfall at this year's Oscars - her first live performance since last year's Grammy Awards. Shakira and her footballer beau Gerard Pique are celebrating the birth of their son. Rihanna is to unveil her debut fashion collection at London Fashion Week in February, it has been announced. Dappy has been found guilty of affray in connection with a brawl at a petrol station. Britney Spears' ex Jason Trawick is still going to be involved in the star's life, according to reports. Taylor Swift is "cool", Ed Sheeran has revealed. 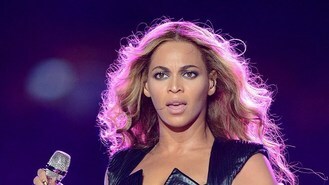 Beyonce has become the first international star to sign up to perform at the Brits, according to reports. Geri Halliwell has shown fans how she cools down in the recording studio - by stripping off. Rapper PSY's worldwide smash hit Gangnam Style has been crowned song of the year by South Korea's music industry association. Kylie Minogue is to star in a new TV comedy drama playing a character based on Andy Warhol's muse Edie Sedgwick. Acts such as Stereophonics and chart-topper Gabrielle Aplin are to take part in a re-staging of a mammoth famed Beatles recording session exactly 50 years on. Lewis Hamilton has been laying down some "megazone beats" in his recording studio. The Shania Twain Centre is closing down due to lack of visitors, and may be turned into a gold mine. Primal Scream will headline this year's Wickerman Festival. One Direction have travelled to Ghana for Red Nose Day. Lady Gaga reportedly wants to buy a share in Michael Jackson's Neverland ranch. Rock legends Black Sabbath have announced the title of their new album: 13. N-Dubz rapper Dappy has denied sparking a petrol station brawl because he was "disrespected" by two teenage women who called him "boring". Tom Odell has revealed that scooping the Brits Critics' Choice award is a huge honour, but it is "crazy". Justin Timberlake has confirmed he is making his music comeback. Taylor Swift has sparked rumours that she might pen a song about her brief romance with Harry Styles. Justin Timberlake is reportedly about to make his music comeback, with a little help from hip-hop star Jay-Z. 50 Cent has revealed he worked hard to turn around his gangster rapper image as it was getting in the way of his business projects. The Hunger Games devoured the competition at the People's Choice Awards, emerging the top victor with five trophies. Dappy has denied sparking a fight at a petrol station by spitting at two girls and claimed that he was the victim of the attack. Dave Grohl is to debut his latest supergroup Dave Grohl's Sound City Players at the Sundance Film Festival later this month. Football bosses are to launch a musical contest with a series of pre-match gigs to find an official FA Cup anthem for this season. Singer Patti Page, who made Tennessee Waltz the third best-selling recording ever, has died at the age of 85.